Doesn’t work properly: batteries dye quick, change temperature from 20 to 40 straight away. Doesn’t show temperature in a room properly. Was using for one or two months and stopped it. I received this thermometer in my baby box (Free in Scotland). It works great and we’ve used it every night since bringing baby home. We haven’t needed to replace batteries yet but it looks like it will be easy to do. Bit of a pain to turn on at times. I received this for free in my Scottish baby box so can’t complain about the price. It’s small and cute. Seems reliable and easily floats in the tub to ensure a safe temperature. Can also be used in the room as a room thermometer. The one and only issue is that it is a bit of a pain to get on. You tap it to turn it on but sometimes it takes a few turns to get it to go on. Otherwise brilliant. I received this product as a gift and we could t ask for a better one, easy to us just tap and the digital thermostat comes on, floats in water and flashes red to indicate water is too hot also a great toy for teething babies too with a smooth design. 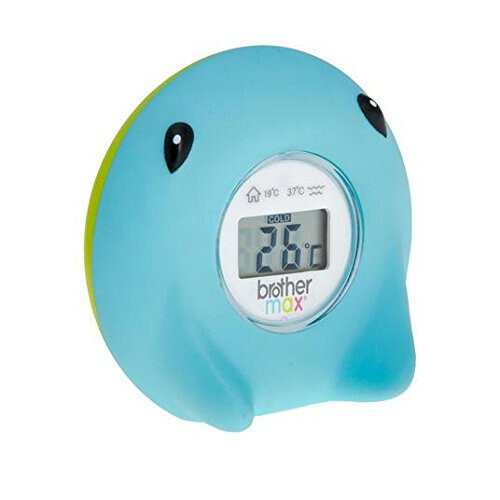 We received this free in our baby box (scotland) and it is much easier and more reliable than a colour changing bath temp sensor for example. It is clear to read, flashes red when too hot and has the ideal temperatures wrote on the front of it so you always know what they should be at. It can also be used to check the temperature of the room. I use it every night at bath time and think it is a great idea. Love how it flashes when the water is too hot and it floats so tests all the water plus My little girl loves it, it's her favourite toy it's the first one she grabs when she goes in the bath. I really recommend this thermometer. It is reliable and can be used in water too. The only issue was with turning it on. Nice colours and good materials used. As soon as I took this out the packet I struggled to figure out how to turn it on i read the instructions and said it was simple tap switch on but could turn it on at all. When i finally managed to get it on it worked well and gave accurate readings. I like the fact that it floats in the water good for baby to play with while in the water. Again struggled to turn off when finished nothing noted in instructions. Overall i would not recommend this item due to it being so difficult to turn on and off. Easy to understand, different colour for different use. I found this product confusing. To start no instructions are given with this product. It’s a “use your common sense” type of thing. I found it didn’t read the temperature right for the bath side of it. The product worked better and more efficient in the House 🏠 temperature rather than the Bath 🛀. Which I hoped both would work equally the same - sad it didn’t. Wasn't for me but couldn't be for yourself! This is a really useful product. It adjusts quickly to the temperature once turned on. I use it every night to help decide what to put my little one into for sleep. The only downside of this product is getting it to come on. It’s supposed to come in with a tap or a shake but my one needs a good few hard whacks to get it to come on, which can be very frustrating. Tells temperature quickly, baby loves to play with it in the bath. Puts my mind at ease knowing babies bath is the perfect temperature. Can be used to give room temperature too. This is a brilliant product I bought this when i had my newborn girl so easy to use just taps on i use mine in the bath only but tells you the perfect temperature flashes red light if it to hot. We have used this since our babies first bath and he is 1 year old now. We love this as it floats and our boy can play with it like its a normal toy. It has never needed a battery change in the year weve had it. It tells the temperature fast and flashes red if too hot, it has an icon for when too cold also, this only work for in the water and would be better if it had a signal for in a room also as being a first time parent i was always worrying what the temperature of his room meant so would be a lot better if had a room indicator. We have noticed a build up of mould on the back even though we have followed instructions to avoid this, it is always left out to fully dry and never left covered whilst drying. Other than this it is perfect for bath time, we just do not use it for in a room. The bath thermometer is a MUST have. It saves time when running a bath for baby no need for topping up with cold if you think it feels too hot, or adding hot if you think it’s too cool. This handy little floating device does it for you. Defo a time saver. Purchase is a must if your not in Scotland. If your in Scotland get yourself the baby box it comes free!! Baby likes to play with it! A poor product from Brothermax. You are supposed to "tap" it for the temperature to display but we had to smack it on most occasions. Room temperature was never accurate, even in Winter it was showing Ibiza like temperatures and when in the bath it claimed the water was am appropriate warmth but I found it much too cold. We preferred the thermometer on our baby monitor which was more accurate and the good old elbow test in the bath is a much better gauge!! Was bought this as a gift when baby was born and at first it was great. Really easy to use and accurate. Only lasted abou 4 months though then started saying the water was 45 degrees when it was obviously cold. This is a fantastic product that we use everyday. Was given free in the Scottish baby box and would still be ad happy with it if I bought it. It gives e great peace of mind at bath time, would highly recomend. I got this free in my Scottish baby box. We use it all the time. It did however take us a while to get it to turn on and the first time it went on was due to me accidentally dropping it. It is very good and reliable. Got one of these with our baby box last august, and still use it everyday. Is a really good little thermometer, and prefer this to the gro-egg one we had used before. Our little one sits and teethes on it at the moment, and it still works a treat. Only thing with it is it can sometimes be a bit slow to react in that ill submerge it to check the low temperature of the water, and have to hold it there for a good couple of minutes before it will tell me how hot it is. (Normally is when its over hot, so i am waiting for it to adjust so i can see how much cold water to add) aside from that little niggle though i am really pleased with it! I got this thermometer for free as part of my Baby Box. Its a brilliant product that works as it should. Love that its sturdy enough for my 5yo to play with in the bath too. Id happily purchase one of these for piece of mind. Easy use, works better than the groegg and seems more reliable too. So good to bath my little one without worrying if it is too hot or too cold . 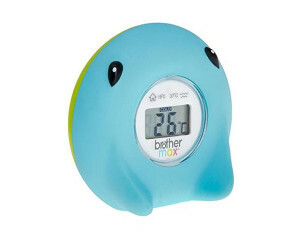 Brother Max Ray Bath and Room Thermometer: This is an LCD temperature display and a high temperature warning provide peace-of-mind that baby’s bathwater is safe.